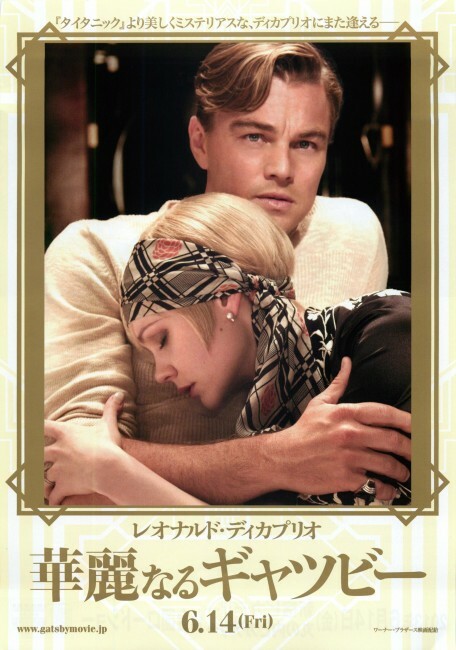 to give those of you who are just as gonzo for GATSBY as I am all the goodies I can gather, in one place: production stills, posters, trailers, behind the scenes looks at making the movie and all the bookish movie news a bookish movie news junkie could want. 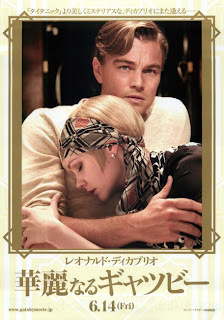 Since I'm looking forward to this one as much, if not more, than Les Miserables which I was utterly obsessed with, I expect to be posting ad nauseum over the coming weeks, so I've decided to dedicate a separate page to the movie where I'll gather my ga ga for Gatsby posts in one place. They'll still be posted here first. To that end, I'm really taken with the poster on the left that they're using in Japan. The soft gold and creamy color palette is both elegant and moody. On the right, is Carey Mulligan looking luminous in that strapless pink gown. 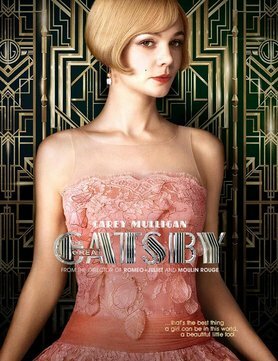 Would I be premature to predict an Academy nomination for costume designer Catherine Martin. She's been nominated for her work on Luhrman's Australia, Romeo + Juliet and Moulin Rouge, winning for the latter. Martin and Lurhman clearly make a great team and it looks like she's up to her usual high standards with some really gorgeous work for GATSBY. Wow- I just learned that she's the production designer too - that's one formidable lady! I'm not sure why but I'm really looking forward to seeing this one. I've seen the shorts a few times, and it's really got me in. Which is odd- I've read the book once, and was quite underwhelmed, so I really don't know what the fascination is. I presumed it was starting soon, but the Australian release date isn't til 30/5. Urgh. Ages away, not sure why they've been showing the trailers at the cinema for months already then. I should think seeing the movie would be fun for you since it was shot close to home. Apparently the old St. Patrick's Seminary in Manly serves as Gatsby's mansion while Centennial Park serves as the grounds to the mansion. The cemetery at Waverley is also seen at one point - I'm not sure how much they show of it but what an incredibly dramatic setting, a cemetery by the sea. So gothic! I'll be scouting around for some location images for another post...if you know of any locations used in Gatsby, let us know!